This blog’s regular likely would not expect me saying “no” to a birthday party. So, you can imagine my surprise reading about revered author Leo Tolstoy’s reluctance to be celebrated. In 1908, as the Russian author of War and Peace and Anna Karenina (and other works) approached his 80th birthday, plans were afoot to organize several big shindigs. There was even talk of erecting a monument, drafting a bill to declare the day a national holiday, and establishing a university in his name to mark the day. What happened on the actual day varies by the source. A video claiming to show his 1908 birthday sees him in a wagon surrounded by hordes of children. Another source speaks of a brass band and hundreds of people outside his home property until he at least came out to make some grateful remarks. 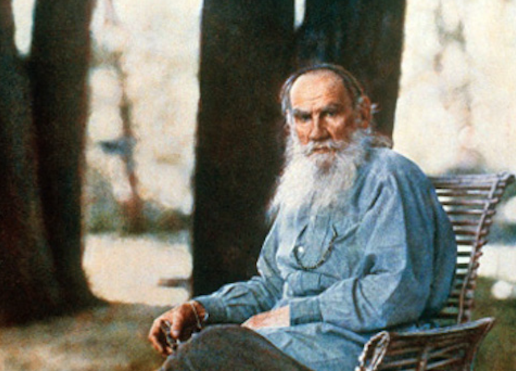 Yet, the Yasnaya Polyana museum reports there were “not so many people” at the property where Tolstoy lived: “only a few reporters and photographers” and “only family members and friends in the house.” Apparently, the recently ill didn’t even leave the house and worked as usual. One wonders how much he could have accomplished, though, with the interruption of receiving six hundred telegrams and about one hundred letters. Within a week of the August 28 birthday, several hundred letters and two thousand telegrams signed by fifty thousand people were received. A box of chocolates from St. Petersburg, picturing views of Yasnaya Polyana, for each of the peasant children. See, even authors who would rather their big day go unnoticed are moved by the kind feelings that come with birthdays! Great stuff! I can imagine him not wanting a big fuss, but at the same time being touched by all the kindness shown to him.